Background: The relationships between adiponectin and clinical outcomes in hemodialysis (HD) patients remain highly controversial. Meanwhile, the association between adiponectin and the peripheral artery disease (PAD) has not been well studied in HD patients without diabetic mellitus. Materials and Methods: The ankle-brachial index was measured in HD patients. Adiponectin levels in 105 HD patients were measured by Enzyme-Linked Immunosorbant Assay. Results: 105 HD patients were enrolled; 14 (13%) patients had PAD. Using receiver-operating-characteristic (ROC) curve analysis for PAD, adiponectin (area under the curve [AUC] 0.935, 95% confidence interval [CI]: 0.848–0.981, P < 0.001) showed significantly positive predictive value. During follow-up (mean 63 ± 30 months), 34 deaths (32%) occurred. Kaplan–Meier analysis found those patients lower median adiponectin had a significantly poor outcome (P < 0.05), and Cox analysis further confirmed that adiponectin was an independent predictor of overall mortality (hazard ratio [HR], 0.832, 95% CI: 0.696–0.995, P < 0.05). The ROC curve of overall mortality showed that the AUC of adiponectin was 0.719 (95% CI: 0.586–0.813, P < 0.05). In HD patients with PAD, the univariate analysis showed that adiponectin (HR, 0.649, 95% CI: 0.527–0.800, P < 0.001) was also associated with overall mortality. Conclusion: Decreasing levels of adiponectin were associated with a significant increase in the risk of PAD in HD patients without diabetic mellitus. Furthermore, as the results of our observation period (maximum of 7 years) showed, adiponectin was a predictor of all-cause mortality in HD patients. Background: Carcinomas of the thyroid follicular epithelium are the most common cancers of the endocrine system. In the diagnosis of thyroid nodules and tumors, the gold standard is histological evaluation. In cases which have morphological overlap, immunohistochemistry is needed for differential diagnosis. 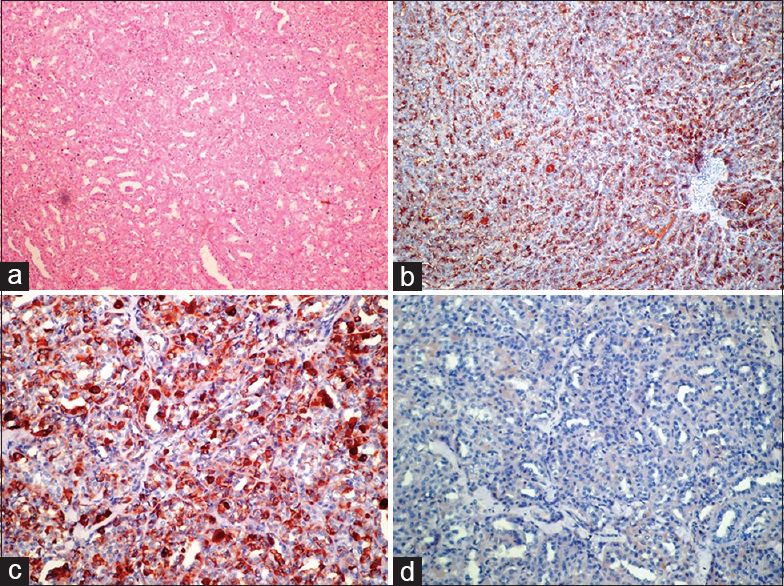 The purpose of this study is to investigate the expressions of CD56, HBME-1, cytokeratin 19 (CK19) antibodies in papillary thyroid carcinoma (PTC) and thyroid nodular lesions and their contributions to differential diagnosis. 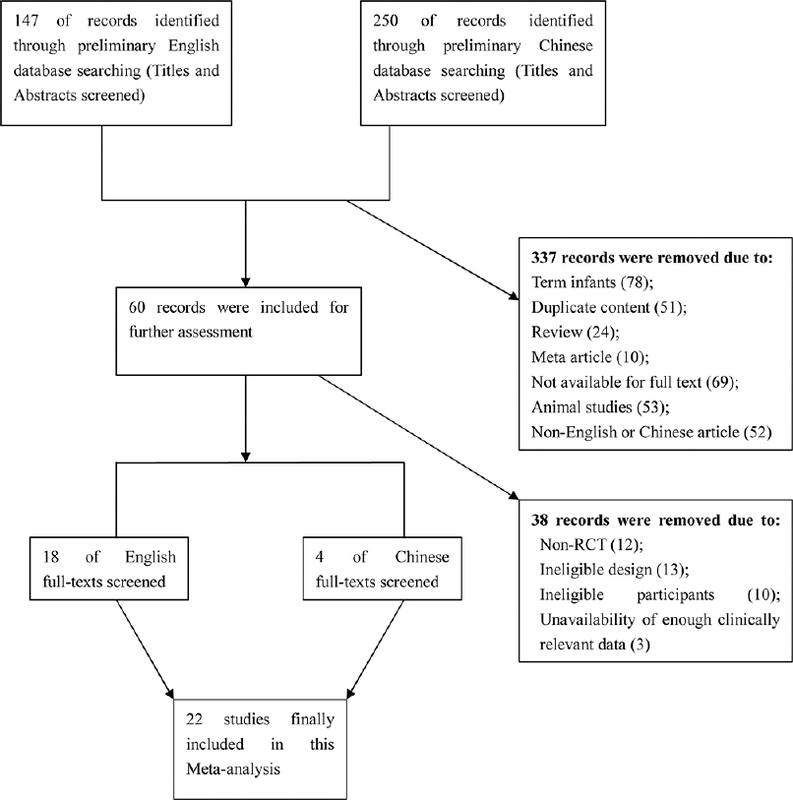 Materials and Methods: In this study, 47 PTCs (26 follicular variant, 21 classic type) and 26 benign thyroid lesions (15 nodular hyperplasia, 10 follicular adenomas, 1 Hurtle cell adenoma) were analyzed retrospectively. HBME-1, CK19, and CD56 antibodies were performed with immunohistochemical methods. The results were evaluated statistically. Results:+3 staining with HBME-1 and CK19 was observed in 72.3% and 83% of patients with PTC. In 95.7% of PTC cases, loss of CD56 expressions in various degrees was identified. A statistically significant difference was detected in HBME-1, CK19, and CD56 expressions between PTCs and benign lesions (P < 0.001). Conclusion: In our study, positive staining of HBME-1, CK19, and loosing expression of CD56 that supports malignancy was found and concluded that CD56 is a helpful antibody for the differential diagnosis of benign and malignant lesions and may increase the diagnostic accuracy when used with HBME-1 and CK19. Background: Musculoskeletal manifestations (MSM) of inflammatory bowel diseases (IBDs) are usually the most frequent extraintestinal manifestations. However, they are not paid enough attention during regular office visits. This cross-sectional study aimed to draw a clinical picture of MSM and their relationships with other findings in patients with IBD. Materials and Methods: Patients of our IBD cohort between March 2012 and September 2013 were consecutively evaluated. Those with current or past history of any MSM were examined by a rheumatologist. The outcome of interest was different MSMs. Distribution of IBD manifestations between the two groups of patients with (n = 20) and without (n = 253) MSM was compared. Logistic regression analysis was employed to find the relationships of demographic, clinical, and laboratory findings with MSM. Results: Two hundred and seventy-three patients were enrolled. 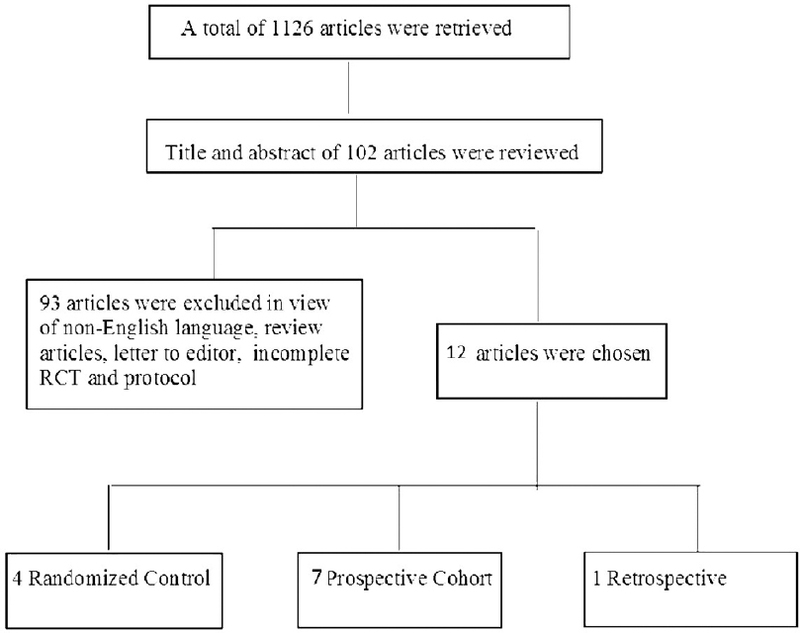 Forty-two patients (15.4%) had extraintestinal manifestations of which twenty patients (7.5%) had at least one MSM. 7/20 patients (35%) versus 22/253 (8.7%) had other extraintestinal manifestations (P = 0.0001). 12/20 patients (57%) had arthritis (polyarthritis, 33% and oligoarthritis, 67%). The most frequent involved joints were knee and ankle observed in 8 (40%) and 7 (35%) patients, respectively. The inflammatory back pain was recorded in 5/20 patients (25%) whereas two patients (10%) had ankylosing spondylitis. In regression analysis, oral aphthous (odds ratio [OR] =8.8 [95% confidence intervals (CI), 1.7–45], P = 0.009) and other extraintestinal manifestations (OR = 5.2 [95% CI, 1.3–20], P = 0.02) were significantly related with arthritis. Conclusion: The most frequent extraintestinal manifestations in patients with IBD were MSM. Knee and ankle were the most frequent involved joints. Extraintestinal manifestations were determinant variables of arthritis. Background: The role of endothelial progenitor cells (EPCs) in the maintenance of vascularization following ischemic brain after experimental stroke has been established. Accordingly, in this study, we evaluated the role of circulating EPCs in transient ischemic attack (TIA) patients for future cerebrovascular (CV) events. Materials and Methods: The level of circulating EPCs (staining markers: CD34, CD309) were determined using flow cytometry at 24 h after TIA in thirty consecutive patients. The EPCs level was also evaluated once in thirty healthy volunteers. Over a period of 12 months, all patients were evaluated by an experienced neurologist for recurrent TIA, stroke or death induced by CV disorders. Results: Circulating EPCs increased in patients group following the first attack of TIA when compared with controls. By analysis of covariance, cardiovascular event history, hyperlipidemia, and statin therapy remained significant independent predictors of EPCs. The mean (standard deviation) duration of follow-up was 10.5 (3.1) months (range, 2–12 months). During follow-up, a total of three patients died due to CV accident and four patients experienced again recurrent TIA. 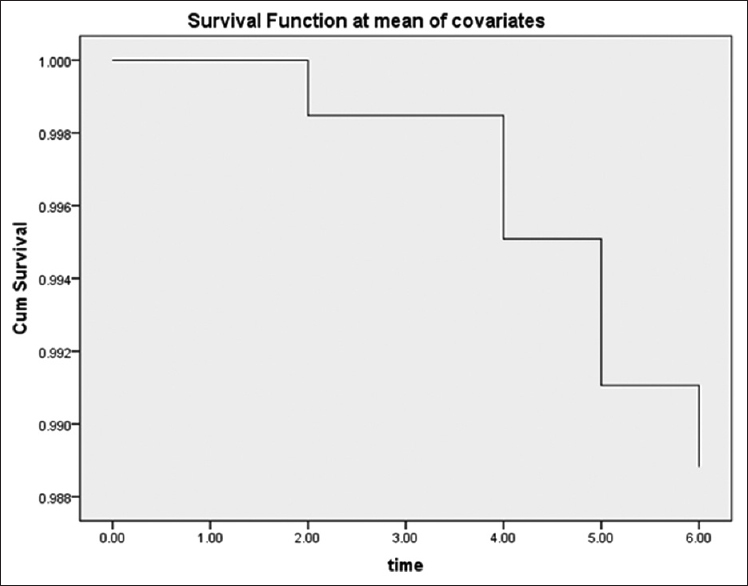 By analyzing data with Cox regression, EPC did not predict the future CV events in TIA patients. Conclusion: Increased incidence of future CV events did not occur in those patients with elevated EPCs in the first attack of TIA. The significant predicting factors of EPCs were cardiovascular event history, hyperlipidemia, and statin therapy. Background: The hospitality design of a hospital is a complex process that depends on careful planning, systematic thinking, and consideration of various factors. This study aimed to determine the viewpoints of patients and their relatives on factors affecting hospital hotel services in Iran in 2015. The results of this study can be used to design a suitable model for the assessment and improvement of hospitality service quality. Materials and Methods: In this cross-sectional descriptive study, 10 hospitals of Iran were included. The subjects of the study included 480 patients and their companions from different internal and surgical wards. Simple random sampling method was performed at the hospitals, where patients were selected through stratified sampling based on hospital wards, and in each ward, through systematic sampling based on the bed numbers. A researcher-made questionnaire was used as the study tool which was developed through reviewing the literature and opinions of experts. Its internal reliability was determined based on Cronbach's alpha coefficient (α =0.85). Results: In reviewing the eleven aspects of hospital hotel services regarding the patients' and their companions' viewpoint, services related to all aspects, whether human, economic, operational, personnel identification, safety, health care services, physical, clinical welfare, cultural, patient guidance, or public welfare services, received mean scores of higher than three (out of five). Conclusion: The present study showed that in the patients' and their companions' viewpoint, factors affecting hospital hotel services in the country are very important. The tool used in this study can be a criterion for assessing the status of the hotel services of the country's major hospitals, so accordingly, the assessment and improvement of the existing conditions can be possible. Background: Limited data available about the mechanisms of dysphagia and areas involving swallow after brain damage; accordingly it is hard to predict which cases are more likely to develop swallowing dysfunction based on the neuroimaging. The aim of this study was to investigate the relationship between brain lesions and dysphagia in a sample of acute conscious stroke patients.Materials and Methods: In a cross-sectional study, 113 acute conscious stroke patients (69 male mean [standard deviation (SD)] age 64.37 [15.1]), participated in this study. 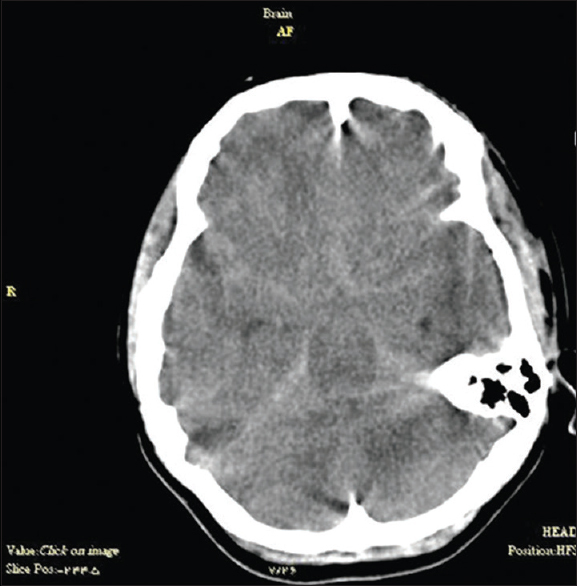 Two neurologists and one radiologist localized brain lesions according to neuroimaging of the patients. Swallowing functions were assessed clinically by an expert speech pathologist with the Mann Assessment of Swallowing Ability (MASA). The association of brain region and swallowing problem was statistically evaluated using Chi-square test. Results: Mean (SD) MASA score for the dysphagic patients was 139.61 (29.77). Swallowing problem was significantly more prevalent in the right primary sensory (P = 0.03), right insula (P = 0.005), and right internal capsule (P = 0.05). Conclusion: It may be concluded from these findings that the right hemisphere lesions associated with occurring dysphagia. Further studies using more advanced diagnostic tools on big samples particularly in a perspective structure are needed. Background: Post- and intra-operative shivering is one of the most complications of spinal anesthesia so recommend a suitable drug with at least complications for prevention and control of postoperative shivering. This current study aimed to compare the preventive effect of hydrocortisone on intra- and post-operative shivering in patients undergoing surgery with spinal anesthesia. Materials and Methods: In a clinical trial study, ninety patients who candidate for surgery with spinal anesthesia were selected and randomly divided into three groups. 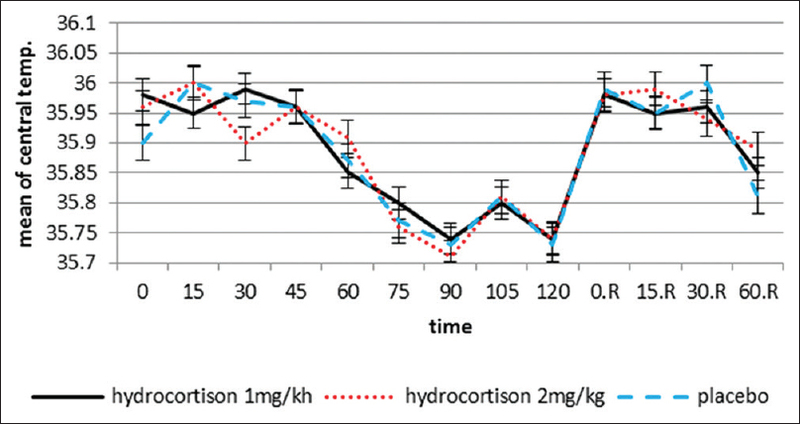 The first and second groups were received 1 mg/kg and 2 mg/kg hydrocortisone, respectively, and the third group was received normal saline, and postoperative shivering was compared between the three groups. Results: The investigation of the incidence of inter- and post-operative shivering in patients in the three groups revealed that within the study period, 31 patients suffered from shivering among which 9, 5, and 17 cases were in 1 mg/kg hydrocortisone group, 2 mg/kg hydrocortisone group, and placebo group, respectively, and according to the Chi-square test, the difference among the three groups was significant (P = 0.004). Conclusion: According to the obtained results, the overall conclusion of the study is that using hydrocortisone at least with the dose of 1 mg/kg as a preventive drug reduced the incidence of intra- and post-operative shivering with spinal anesthesia. Background: Serum procalcitonin (PCT) levels differ in patients with bacterial or fungal infections and are significantly elevated in patients with Gram-negative bacteremia. We evaluated the diagnostic accuracy of different inflammatory markers to discriminate sepsis caused by different pathogens. Materials and Methods: We included 328 episodes of bacteremia from 292 patients with sepsis and 31 patients with suspected sepsis in this study. Medical records of patients who had bacteremia caused by Gram-negative bacteria (Gram-negative), Gram-positive bacteria (Gram-positive) or fungi were reviewed, and information about PCT and other inflammatory markers was recorded. The diagnostic performance of inflammatory markers was calculated via receiver operating characteristic (ROC) curves. Results: Serum PCT levels in Gram-negative, Gram-positive, and fungal sepsis were 7.47 (interquartile range [IQR]: 1.09–41.26) ng/mL, 0.48 (IQR: 0.15–2.16) ng/mL, and 0.60 (IQR: 0.14–2.06) ng/mL, respectively (P < 0.001). 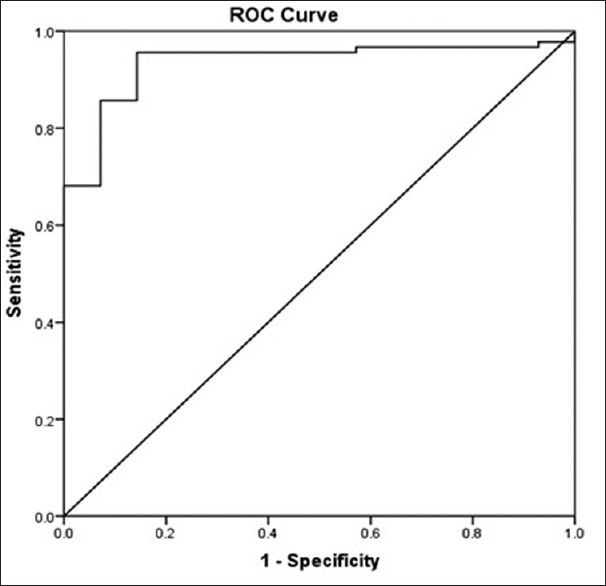 ROC analysis revealed an optimal cut-off value of 2.44 ng/mL for PCT in discriminating Gram-negative sepsis from Gram-positive sepsis, which yielded a sensitivity of 68.4% and a specificity of 77.1%. An optimal cut-off value of 3.11 ng/mL for PCT in discriminating Gram-negative sepsis from fungal sepsis, led to a sensitivity of 63.9% and specificity of 93.3%. Neither PCT nor other inflammatory markers could be used to distinguish between Gram-positive and fungal sepsis. Conclusion: Serum PCT levels were significantly higher in patients with Gram-negative sepsis than in those with Gram-positive or fungal sepsis. 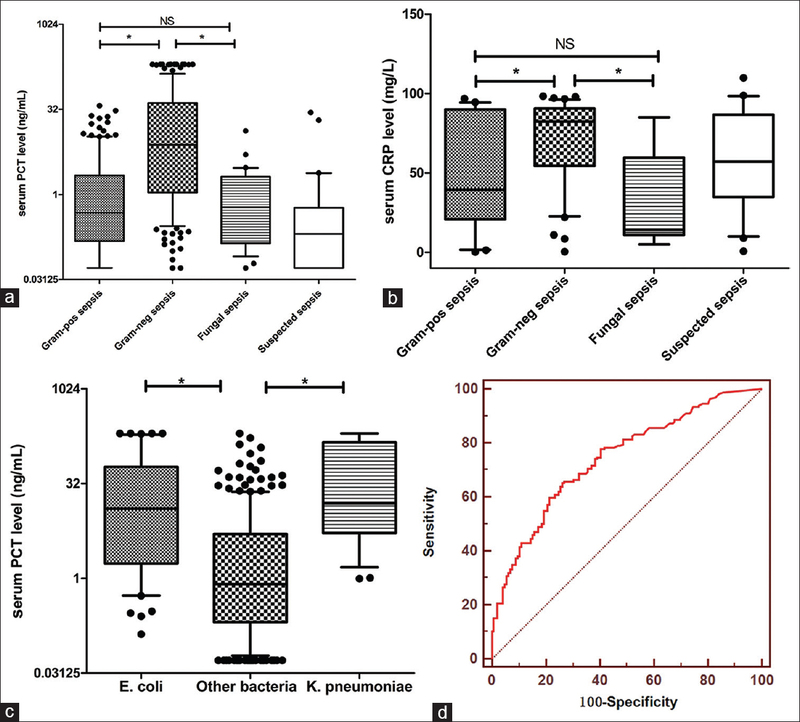 PCT is a potential sensitive biomarker for distinguishing Gram-negative sepsis from Gram-positive and fungal sepsis.